Two black holes circle each other in a gravitational dance. Spiraling closer over thousands of years, they eventually get so close that they can no longer keep dancing. In a fraction of a second these two black holes merged into a single, larger black hole. It’s an event that happens fairly regularly throughout the universe. But this time, a group of humans 1.3 billion light years away measured the ripples in space and time produced during the merger. 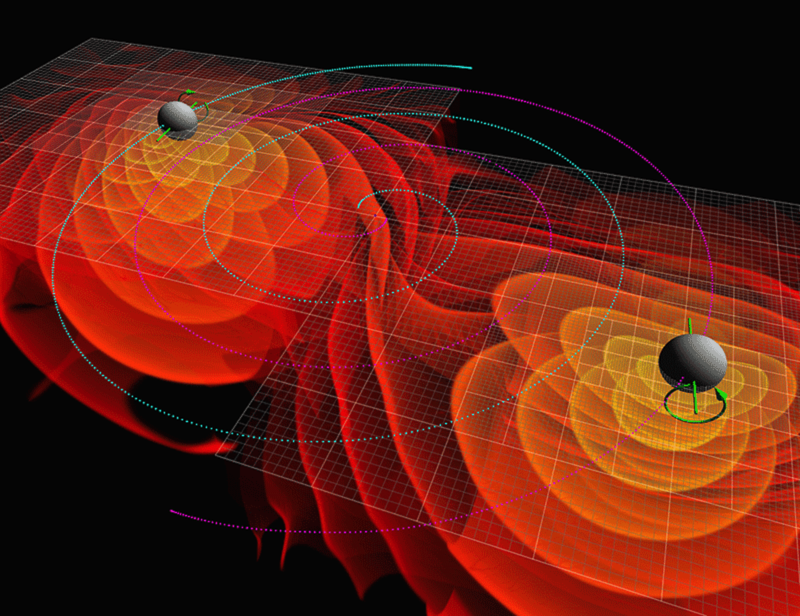 It’s hard to overstate the significance of our first direct detection of gravitational waves. On the one hand the discovery announced in Physical Review Letters confirmed what we’ve suspected for decades: gravitational waves exist. By itself that’s not a big deal, since they are a natural result of general relativity, and we’ve had indirect evidence of gravitational waves since the 1970s. The direct detection of gravitational waves is yet another confirmation of what we’ve already known. On the other hand, this opens up an entirely new window to the universe. 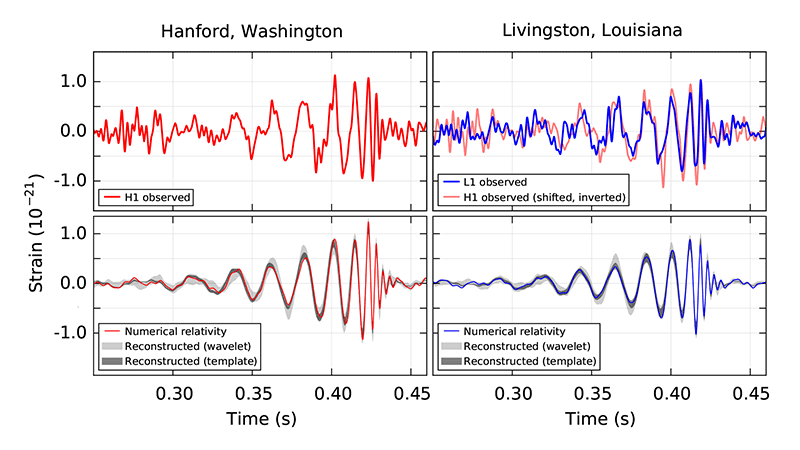 The event as seen in the two LIGO detectors (above) compared to the numerical model fits (below). Credit: B. P. Abbott et al. The paper released today has been peer reviewed, which is comforting given the BICEP2 incident. It’s also a remarkably strong result given the extreme sensitivity necessary to detect gravitational waves. The advanced LIGO experiment consists of two detectors located in Louisiana and Washington. To qualify as a real detection, there must be a nearly simultaneous event in both detectors with the same basic form. In the above image, the event in question matches up quite well. It also matches the expected signal as calculated from numerical simulations of merging black holes. This is a strong, clear signal confirming gravitational waves. 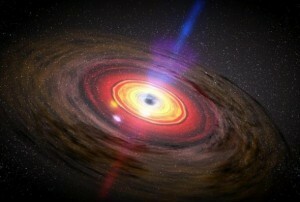 The data is good enough that we actually know quite a bit about the merging black holes. The larger black hole had a mass of about 36 Suns, while the smaller one had a mass of about 29 Suns. When the two black holes merged they formed a single black hole of about 62 Suns. You might notice those numbers don’t add up. That’s because in the process of merging, about 3 solar masses worth of energy was radiated away as gravitational waves. That’s a huge amount of energy to release in a fraction of a second, which is why we can detect it so clearly from more than a billion light years away. We also know some broader characteristics, such as how fast the final black hole rotates, roughly where in the sky the merger occurred and the cosmological redshift of the event (which is how we know its distance). While the detection of gravitational waves is the biggest news, this is also further confirmation that black holes are real. If they weren’t black holes their merger would create a burst of light or neutrinos like a stupendous supernova, which wasn’t seen. This is also the first clear observation of a black hole merger. In the history of human civilization humans looked up at the sky and saw light. When Galileo first raised his telescope to the sky he saw light. Over the centuries we’ve widened the range of what light we can observe. We’ve launched telescopes into space to see types of light not visible from the ground. With the exception of some neutrinos and cosmic particles, the field of astronomy is rooted in our ability to observe and analyze light. But now we can listen to the very fabric of space and time. What’s amazing is that they’d only just restarted their equipment after a major refit. This was one of the first detections and it completely validated not only the refit but the entire project. 1. Are gravitational waves transport energy? 2. Can we detect dark matter and dark energy with the gravitational waves? 1. Yes. 2. Good question. I’m sure people are working on that. One question I’ve asked elsewhere, but haven’t yet got a response: close to where the two black holes merged, what effect, if any, would the intense GW radiation (energy equivalent to 3 sols!!) have had? For example, if there were a rocky planet 1 au away (implausible, of course), would it have been stretched and squeezed so much as to have been turned into a gas? Or would the GW have simply passed through it with no effect at all? If a LIGO-like detector – 2 arms, 4 km in length, mirrors, lasers, etc – were at such a distance, how big would the movement of the arms (distance between mirrors) have been? Tens of meters, more/less? I haven’t worked through the calculations, but I imagine anything close to the black holes when they merged would have been torn apart by the gravitational forces. I agree that the gravitational effects of the BHs themselves would likely shred anything close (tidal forces), but consider a minimal mass white dwarf, say, at a distance where it would not get spaghettified: how would such an energetic GW from the BH merger affect it? Also, what about dust, molecules and atoms; even close to the BHs they’d not be ripped to individual atoms or ions by the tidal forces (or would they? ), but how would they be affected by the passing GWs? One aspect of the significance of detecting gravity waves is not so much the confirmation of general relativity, but that now we have a benchmark that will allow us to get better at how to do this. In a few generations, a gravitational telescope will make LIGO seem quaint and crude. This is too exciting for words. The best part is that FINALLY there is observational evidence for Black Holes. You stated that we know “the cosmological redshift of the event (which is how we know its distance)”. I fully understand that electro-magnetic waves contain the redshifted emission/absorbtion signatures of the various elements. However, could you expand a bit on how evidence of redshift is coded in gravitational waves? Is a 5% loss of mass something that depends on the characteristics of the black holes merging, rotation and relative speed to each other, or is it just based on the combined mass? So things *can* fall into black holes (in this case, another black hole) without taking an eternity (due to time dilation) for outside observers to observe the event! Or is this a special case scenario because the infalling object is another black hole, so somehow the eternal time dilation isn’t applicable? Or are gravitational waves not bound to the rules of time dilation, since gravity itself is simply a measure of the distortion of spacetime? It is unbelievable. Is he right? Likely. I haven’t done the calculation myself, but it seems reasonable. The article mentions “Cosmological Redshift” to compute the distance to the event. For light waves from distant sources absorption and emission bands int he light are displaced and the amount of displacement gives the ‘red/blue’ shift of the object. What Plays the role of Absorption and Emission Bands For Gravity Waves?